Regulatory bodies are pushing financial institutions to comply with an increasing number of policies aimed at controlling the new state of the banking sector. In turn, the industry has seen a trend towards consolidation of banks and credit unions in Australia. Twenty years ago there were more than 300 credit unions operating in Australia. Today there are less than 75, and expectations are that we will see consolidation continue. Within this context, it becomes vital for banks to adopt a comprehensive strategy for acquisitions and mergers. A key consideration of this strategy must include the IT setup. Industry leaders and systems administrators in the financial sector need to adopt the right approach and solutions if they want to come out fighting in an era where digitisation is everywhere, and IT efficiencies can create competitive advantages. The consolidation of banks and credit unions is seen as a way to drive efficiencies, improve sustainability, and increase access to funding sources, in order to comply with strict international (BASEL II and BASEL III) and domestic (APRA) regulatory requirements aimed at eliminating underperforming funds. But when organisations merge or make an acquisition, they often end up with many disparate systems. Managing all these systems can be expensive, and consolidating reporting from multiple systems for both management and the regulator is made even more complex and inefficient, thereby minimising efficiency benefits expected from a consolidation. To maximise efficiencies, it is important to consider your strategy for bringing all the systems together. Firstly, determine which system you will continue to use and which you will eliminate. Consider whether your current system infrastructure is scalable and can manage the increased workload. This can be the opportune time to ditch legacy systems, that are overly customised, in favour of more sophisticated back office systems that are specifically designed for the banking sector and will integrate with your core banking system. A recent financial services survey revealed that 62% of financial institutions’ CEOs believe technology has a major role in strategic planning. The survey also listed back office process improvements as one of the top 3 strategies for innovation. CEO’s are looking for technology solutions that will enable them to consolidate data, provide more services to customers, and improve their cost to income ratio. To gain these efficiencies, banks and credit unions should be looking towards a highly integrated and intelligent system that can provide a holistic view of the business to identify growth potential across channels and platforms. The core banking system is the most critical system to any financial institution, and therefore the biggest project to replace or consolidate. To minimise the initial impact of a merger to your organisation, it may be more practical to get your back office in order first. Ensure your organisation has a single financial management and reporting system across the whole of the business that will integrate with any core banking system you decide to use, which will make life easier when you go to update the banking system. In order for banks to enter the next digital age and cope with sector consolidation, they need to start implementing change management strategies. An employee's identity at work is often closely tied with the enterprise systems used. Since changing your entire system means in some way changing your culture, effective change management with technology is vital if you want to keep cultural alignment within the company. * Make known the benefits that using these new systems will bring to individuals, such as time savings and reduction of manual data entry. People only fear change if they perceive it as a loss. * Implement one new thing at a time, don’t try to change everything across the organisation at once. Bring your people on a journey. * Train your staff properly on any new system or process, so they feel comfortable using it. Once staff are fully trained, ensure widespread adoption across the business - this is where the efficiencies really come from. To remain profitable in this highly competitive market, many acquisitions include the addition of new services that weren’t previously offered, such as life and general insurance or wealth management services. The acquisition of these new services often bring legacy systems that are different to traditional banking systems. It can be complex to integrate these into a back office system that is highly customised for your traditional (banking) operations and isn’t flexible. Make sure your business software is both flexible to include new services and scalable to grow. Whether your financial institution is thriving, consolidating or making acquisitions, it is important to have an effective IT strategy that addresses the above key considerations. Given the certainty of regulatory changes of the future, now is the time to consider the ability of your existing software to support and inform your business in an increasingly competitive environment. Sean Tuckett is the Industry Manager for Financial Services at TechnologyOne. Sean has more than 25 years experience in senior corporate, commercial and strategic roles across a diverse range of industries including multinationals, government and financial services. 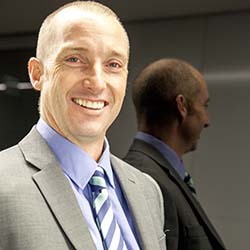 During his tenure with TechnologyOne, Sean has undertaken a number of key roles including sales management, service delivery, staff training and development, strategic planning and industry engagement with peak bodies including APRA, Financial Services Council and COBA.